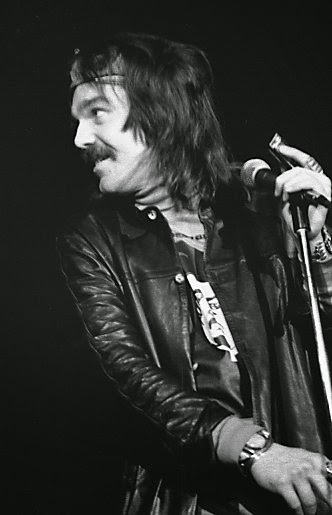 Mankind will not really awake the death of Don Van Vliet, aka Captain Beefheart. But the hippie generation knows him from his experimental blues and his friendship with Frank Zappa. Raw vocals and rhythmic antics were characterized by an eccentric. However, early eighties, he finally took leave of music to focus entirely on art. Too little commercial success (and not paid for a European tour) and later health problems forced him to stop. Multiple Sclerosis he was ultimately fatal in 2010 at the age of 69. His legacy consisted of 13 non-commercial LPs but also a large number of lucrative paintings and sculptures. The last years were spent in a wheelchair, a swan song. The live performance that will see the light of day on the famous Gonzo Multimedia label, unfortunately does not stand out enough of purity. It's an obscure amateur recording (at that time the technology could hardly be otherwise) which was made a bootleg album from. And it appears finally on CD, without digital processing. 'This extraordinary record catches the Captain at his best; live on stage in 1973. Someone who was in the audience That Night later wrote: "The Captain Beefheart show was beyond my expectations, it washed over us with a magic gumbo or free jazz, swampy blues, avante garde squawking and punky insolence. We loved it. We did not know what it was, but we loved it. Captain Beefheart was at least twice as old as most of us in the room, but tat was not an issue, not in the least. It rocked our world. " Frank Zappa fan, I can follow the Captain and his former fans. He tried to reconcile white blues and psychedelia with substandard Zappa freaking. And that this was not always chewed as well, and therefore spewed soon, was obvious. But a live performance was a big party in the seventies, angrily associated with an amount of spiritual resources. Captain Beefheart's excesses went at that time or in like hot cake. The disillusionment came the next morning though. Time image on this CD, everything and anything goes, it is also true completely. And this is perhaps the only reason why you can spend a few dollars on this disc.